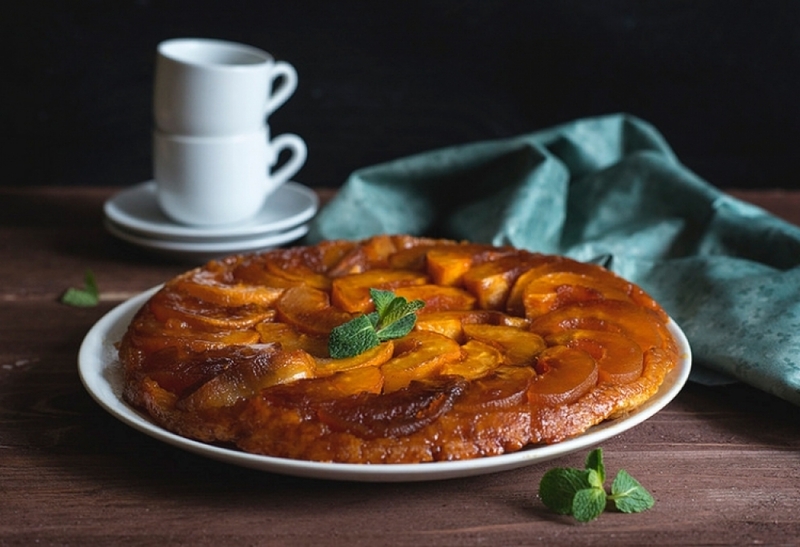 Tarte Tatin is probably the most famous upside-down pie. It is very simple and incredibly tasty. Delicate crumbly dough, a layer of juicy apples, soaked in golden caramel and delicious flavor. This pie is usually served warm with a scoop of vanilla ice cream, but it is also very good when cold. It is said that this dessert was invented by accident in the hotel belonging to Tatin sisters in the late 19th century. One of the sisters forgot to put the dough for the pie in the form before putting the filling, and to fix this unfortunate mistake, she decided to cover the apples with the dough on the top. 1. In a bowl, beat butter with sugar and salt on medium speed. It is convenient to pre-cut butter into small pieces. Add an egg in the process of beating. 2. Gradually add flour, continuing to whisk. It is important to monitor the consistency, it is not obligitory that youll need all the flour specified in the recipe. It all depends on the humidity of the flour - the drier the flour, the less of it is necessary. The dough should be pliable, not tight. Too tight dough will crumble when rolling and you will hardly manage to cover the filling. However, if it is too little flour and a lot of fat, then in the oven the dough will turn into porous mass floating in melted butter. If you have already overpoured the flour a little at this stage you can add a little ice water to the dough. 4. Crumple the dough on a working surface with the bottom of the palm, as if wiping it. Thus we will be sure that there are no unmixed pieces of butter in the flour. But dont knead the dough with your hands for long - 3-5 such movements will be enough. 5. Roll the dough (from the center to the sides) to a thickness of 4 mm between two sheets of parchment paper (the bottom sheet and the surface of the dough should be sprinkled with flour) and put into a fridge for 30 minutes. 6. Make caramel. We need to achieve a complete melting of the crystals of sugar to a beautiful golden shade. And, of course, dont let sugar burn. Add sugar, a little water (1-2 tablespoons) and some lemon juice (~1 tbsp) to the pan. Immediately put the pan on high fire and melt the sugar, do not stir. You can shake the pan lightly. 7. The sugar will start to melt and slowly show color. It is important that the bottom of the pan should coincide with the diameter of the burner for pan to be heated evenly. 8. When the caramel color and a light smoke appear, immediately turn off the fire. 9. Add alcohol, butter and a cut lengthwise vanilla pod. You can gently stir the contents of the pan. If you add a bit of salt, the caramel will become salty and balance out the sweetness of the filling. 10. Peel apples, cut out the cores. Cut them along the cores into two halves, and then each half crosswise into two equal parts. If you pre-clean the apples, put them in a bowl of water and lemon juice for them not to darken. Before putting the apples to the form, dry them with paper towels to remove the excess of moisture. 11. Spread the apples over the caramel very close to each other. Remember that the side that now lies on the bottom will become the face of your tarte Taten. 12. Take out the dough from the refrigerator, let it soak for 10 minutes. Roll the dough a little more to obtain a layer thickness of 3 mm and cut out a circle matching the diameter of the pan. 13. Spread the batter over the cooled pan, it should fit snugly to apples. Pierce with a fork in several places and send to cold for 10 minutes. 14. Bake in a preheated over 180-190 degrees oven for 25-30 minutes. Let it cool a little, cover with a plate and turn around. 15. Warm tarte can be served with vanilla ice cream, fat sour cream or whipped cream.